Welcome to the very first edition of "The Holiday Series" which will be a long series that I put together, working with a dozen or so of my favorite bloggers - most of which I collaborated with for "The September Issue". This elaborate, massive, creative, stylish and super fun holiday series which starts today, will have 6 holiday-related posts and we haven't left behind Thanksgiving though Christmas, Hannukah and New Year's are right around the corner. 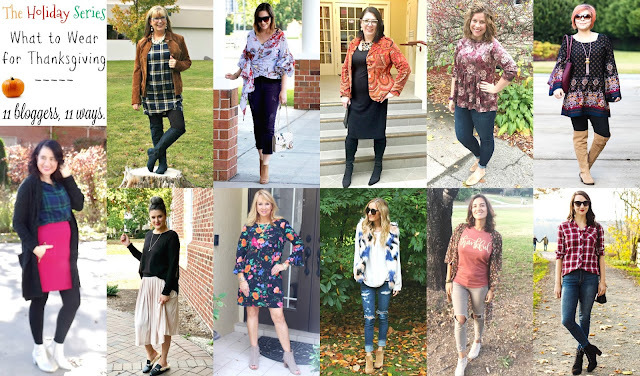 Today we start off with our first post where myself and ten other bloggers show you all 11 very different outfits you can wear to celebrate Thanksgiving Day. From casual, to semi-dressy to dressed up, whether we are wearing flats, mules, booties or OTK boots, there is something for everyone and for every age too. So read on to see what myself and these ladies have planned for Thanksgiving and most importantly what we are wearing. Let's not forget, Thanksgiving is only 2 weeks away now. I couldn't help but notice how fun, put-together and festive each of these outfits are! I noticed that all of our looks couldn't be any more different, as if we had arranged it ahead of time. My favorite outfit hands-down is Lee's. It is fun, modern, cozy, sporty and out of the box but I also love Monica's and Whitney's - their floral tops are beautiful! And Chrissy's rust 'Thankful' tee is perfect on Thanksgiving day. My Thanksgiving this year will be a simple event at the comfort of our home. Unfortunately, we will eat dinner kind of late because of some late arrivals (due to them working). We are not much turkey eaters, maybe because we grew up in Albania and it is not that common to eat it there (except on some areas of the country, the tradition is to cook+eat turkey for New Year's Eve). But my mom will cook some steak and we might do a little turkey too. My mom makes the best stuffing, mashed potatoes and my favorite - cranberry sauce - so we will have some of each. A healthy green salad and a tasty soup will be part of our dinner too, as will red wine, and we will finish off with cake and coffee. I like to dress up a little even-though we will be home. That is why I chose a dark flannel button-down shirt from Old Navy (these come in many different plaid/color combos and I purchased three of them, but you might want to size up), which I tucked into a fun bright-colored skirt (it is like a brick red and the material is so thick and warm) from Loft. This mini skirt is currently on sale but I cannot find online (though this one is very similar and also a steal). I love the zippered pocket detail of this skirt. Over the outfit, I am wearing a long and very warm cardigan coat which has over-sized pockets and it is in a marled forest green+black chenille material by A New Day - Target's newest women's clothing brand. I love how well the cardigan matched the plaid shirt. This cardigan would be great to wear if you celebrate Thanksgiving as a guest somewhere because you don't even need to carry a purse, it will keep you warm (it can substitute for a blanket) and will hide all the food you will be eating. 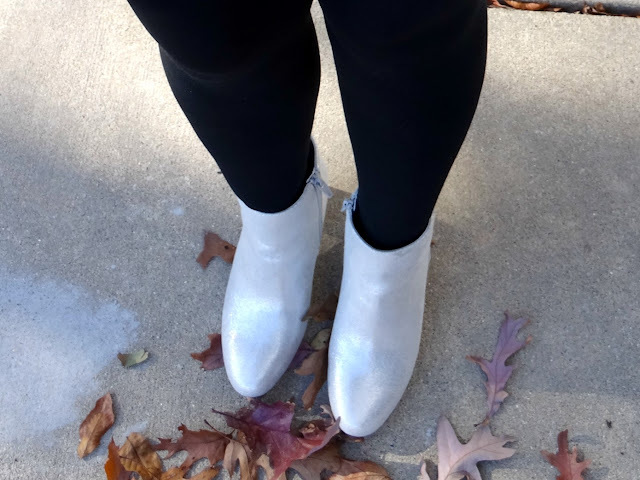 Of course I am wearing black opaque tights cause the temps are 40s and less and I paired them with white booties because they are a trendy current item that makes a statement. The best thing about these gorgeous boots is their metallic sheen, they look silver. They are a very well-made faux suede and also by the new brand A New Day at Target. 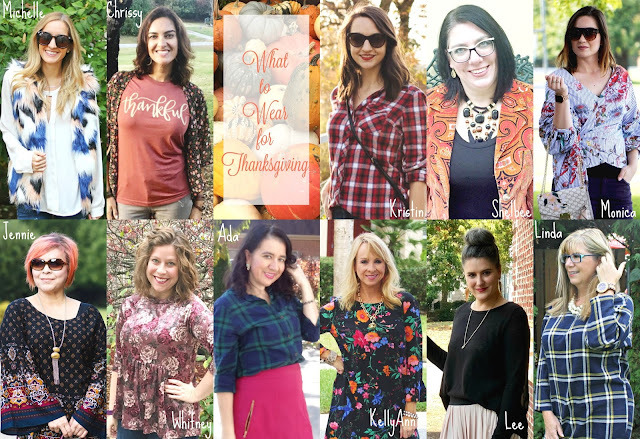 Read on to see everyone's Thanksgiving plans and stop by these fabulous ladies' blogs, today, also. Michelle: "On Thanksgiving, it's all about food, family and comfort! Adding a vest to jeans and a blouse is the perfect way to make a casual outfit appropriate for Thanksgiving dinner!" Chrissy: "Every year our family of six hops in our minivan and travels to central Illinois to celebrate Thanksgiving with my husband’s side of the family. I chose this outfit because I love the colors, as well as the reminder to be thankful." Kristin: "Living overseas makes it hard to be home for Thanksgiving, so this year my husband and I will attend a casual Friendsgiving. This red flannel has been in my closet FOREVER and I love it for Thanksgiving because it's as traditionally 'fall' as you can get!" Shelbee: "This year for Thanksgiving, we are joining our best friends at their house and decided we might want to dress up just for the fun of dressing up. I chose a black knit long sleeve dress with lots of stretch to accommodate for food intake. My favorite red paisley blazer to add some color and tall black boots with a modest heel. A statement necklace completes the outfit. 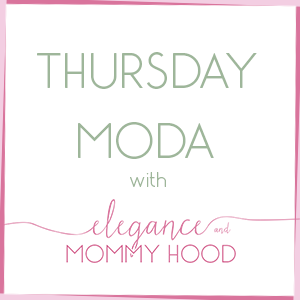 Comfortable, chic, and fun!" Monica: "Hey y'all! The Thanksgiving holiday will be here sooner than we think! I wanted to show one of the many outfits that I'll be choosing from, on Thanksgiving. Over the past few years I've loved the whole casual vibes for Thanksgiving. I also make sure to find an outfit that will hide the food baby I'll have after eating on Thanksgiving! Since the fiance and I go to two different places on Thanksgiving, we eat double. With that being said, I love this top because the sleeves are such a statement that no one will be looking at your stomach. Plus, it's a super cute top. The pants are really comfy and have stretch to them, so you won't have to worry about your pants not being able to expand, these will expand with you lol. Check out more looks like this one on my blog Jersey Girl, Texan Heart. 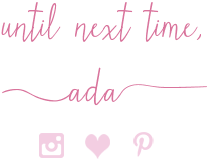 As always, thank you to Ada for hosting this awesome collab!​"
Linda: " I love dressing up but I always need to be comfortable enough to serve and get everything ready for our guests. This Old Navy Tunic is a fav that can be dressed up or down at will. With fun leggings and OTK boots I am fall appropriate. Adding the pearls seemed to dress it up slightly." Lee: "Hi, I’m Lee and my blog is Wine and Couture. This year I am hosting, for the first time, Thanksgiving Dinner at my home. I am excited to decorate and have family over to share good food with." Kellyann: "Our Thanksgiving plans include dinner with our family. We usually eat outside and don't expect cold weather so this dress and booties are perfect!" Ada: "My Thanksgiving plans are laid-back. Some of my family members work till the afternoon. But we will get together, have a bigger meal than usual, talk, drink coffee and love on each-other. I chose a semi-dressy outfit this year consisting of a thick, brick-red skirt (it has the cutest pockets) with a forest green+navy plaid shirt and some fun sparkly white booties to glam it up. Also, I chose a long coatigan (cardigan sweater) as a topper." Whitney: "This year I will be celebrating Thanksgiving with my family and boyfriend at my sister's new home in Colorado Springs. I usually want to be comfortable (obviously) but a little bit dressed-up and festive, so this year I'm wearing an on trend velvet top in fall colors." Jennie: "We are looking forward to having our four sons, daughter-in-law, and dogs together under one roof again for Thanksgiving! My autumnal colored shift dress is not only stylish with its bell sleeves, but also works well with leggings for a comfortable look that will disguise my holiday food baby!" Of course, I glammed up this look a little bit, from the makeup to my choppy curls and definitely these Gorgeous Pina Studs which I cannot stop wearing lately - I think they will be great for ALL holiday season. I am also wearing a bold lip, this Fuchsia Lipstick (but mine is slightly different; color is "Wizzard of Orchidz") from Ulta. 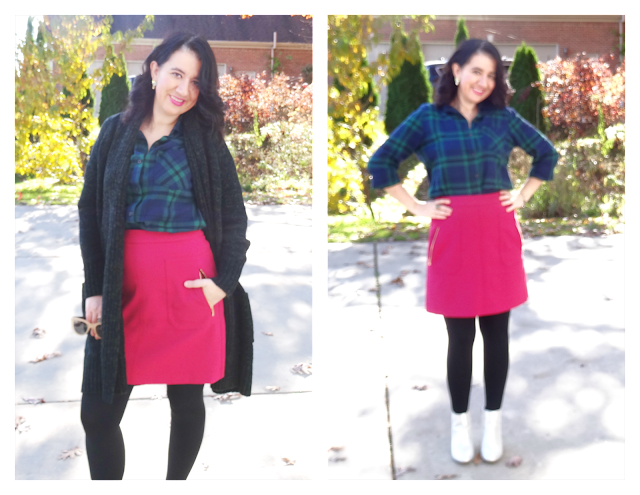 And what makes this Thanksgiving Outfit perfect is that it represents me and the stores I love very well because the three brands I shop the most the last few years are Target (coatigan and booties are from there), Loft (skirt and sunglasses are from there) and Old Navy (flannel). What are you doing for Thanksgiving?! Are you the host or the invited guest?! What will you be wearing?! Stay tuned for our next collaboration on "The Holiday Series" - scheduled on November 21st - where we will show you cute and comfortable outfits to wear (and shop in) on Black Friday. Thank you for reading and check out at least one of the other blogs participating in this collab, today.